Greetings cardfighters! 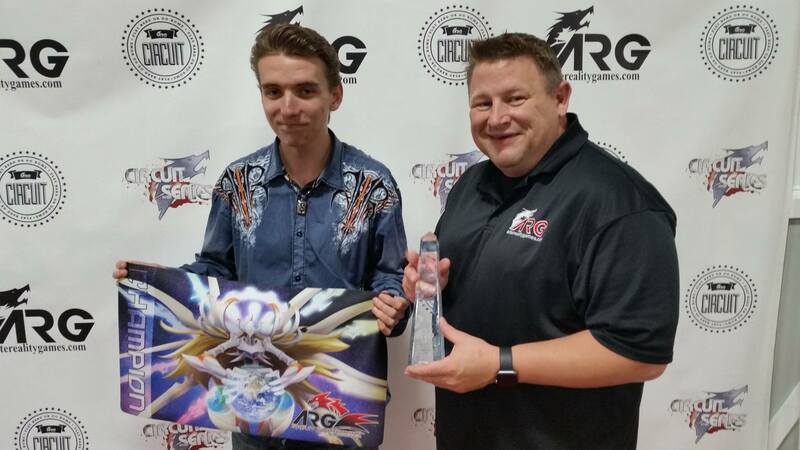 This weekend was an exciting one as we just finished ARG's first ever National Tournament for Cardfight Vanguard. This week's article includes the winner Matthew Day's decklist and his analysis of how the event went for him and his deck. 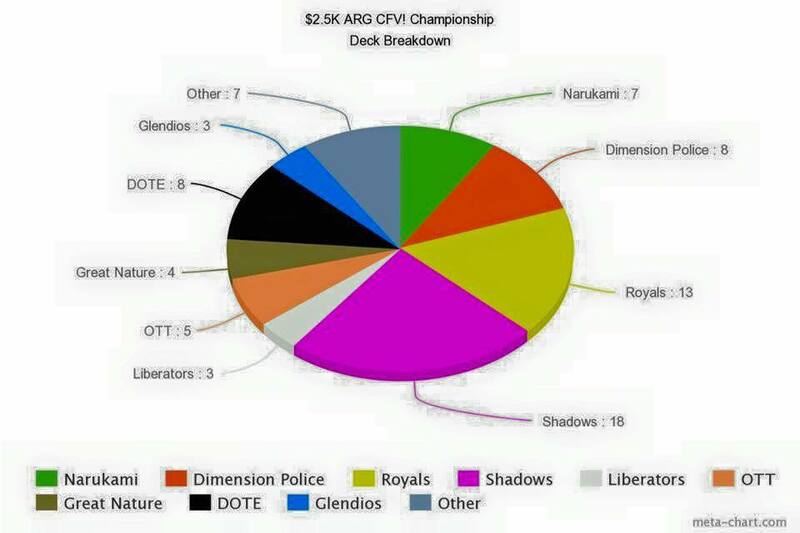 I also have pie charts for the specific ratios of this tournament! There were 78 recorded participants, but this is not counting the players who had byes though apparently. This is the make-up of all the decks played at the tournament as of round 1 (so the players who had byes are not counted). As expected, Shadow Paladin was the most played deck in this event by a significant margin. Royal Paladin is a solid second seeing the rise of popularity for the Sanctuary Guard Dragon deck and also was the deck that earned 1st place. From there on, the other popular clans were present in generally similar numbers. What really surprised me is the lack of Aqua Force. The deck has done so well in previous ARG events this summer that I was sure the deck was going to have a solid presence in the National Tournament but they are nowhere to be seen. It's possible they were lumped in the "other" category as this pie chart was provided to me, but they did not place in the Top 16 cut. Speaking of which, here is the breakdown of the Top 16. The Top 16 breakdown is somewhat in proportion to how the tournament began via percentages. Shadow Paladin took up 31.3% of the decks in the Top 16 and 23% of decks played in the overall tournament, clearly showing them as a dominating force. 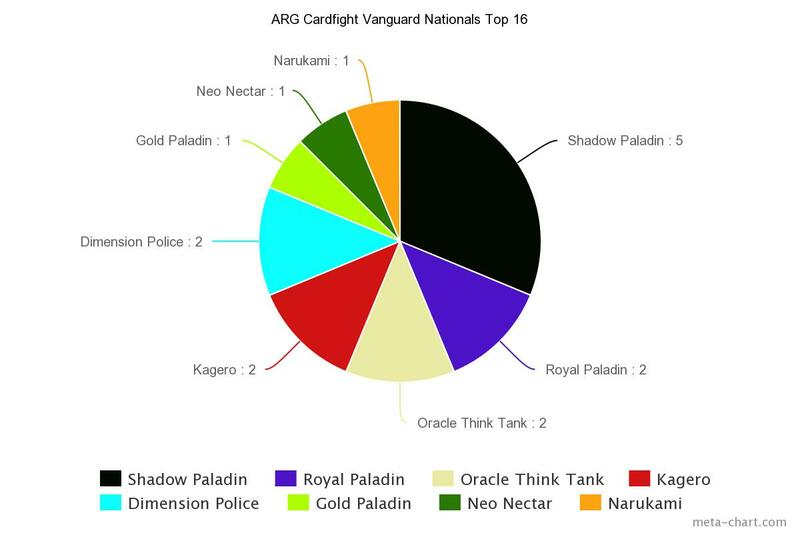 Kagero, Dimension Police, Oracle Think Tank and Royal Paladin took 12.5% of the decks in the Top 16, while taking similar numbers in the overall tournament (10.2% for Kagero/Dimension Police, and 16.7% for Royal Paladin). Link Joker and Great Nature were all knocked out in swiss rounds, and we had a Gold Paladin, Neo Nectar, and a Narukami deck squeeze in the last remaining slots. I had a chance to talk to Matthew about his deck and how the event went for him. 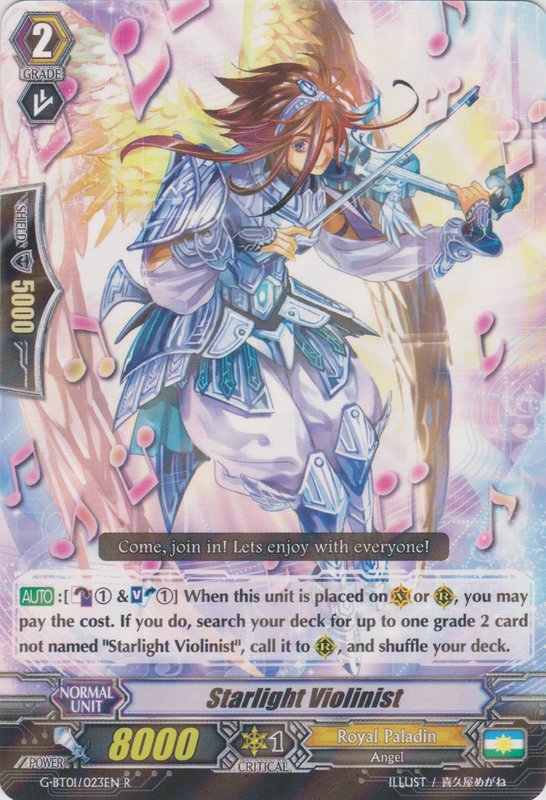 Regarding his build, he said the MVP card was definitely Starlight Violinist. He said the card was very powerful in the early game as it gave a huge advantage and it also served as extra copies of Jewel Knight, Swordmy in his deck. He stated that if he were to do the event all over again, he would easily bump this card to three copies instead of two. He also was unable to obtain the Jewel Knight perfect guard Flashing Jewel Knight, Iseult so he was forced to run G-Perfect Guards as a replacement, which caused him trouble in his playoff matches against Kagero and Dimension Police, who abused his rear-guards. Keeping the rear-guards in check is a popular tactic to play around Sanctuary Guard Dragon, as it keeps their damage zone in check by limiting their counterblasts and it also reduces the impact of Holy Dragon, Sanctuary Guard Regalie. Other then that, he said there was nothing else he would change in his deck until further support comes out in G-BT04: Soul Strike Against the Supreme. He ran two copies of Miracle Element, Atmos which people would normally consider strange. Matthew's reasoning for it was that it was to account for the Messiah Link Joker match-up, which he says the deck auto-loses to. His strategy was to use Atmos to grind out the Nebula Dragon, Big Crunch Dragon turns and use Holy Dragon, Saint Blow Dragon after their Perfect Guards were used up. Thankfully for him, he ended up not even playing against the deck. Matthew said he ran Shining Knight, Millius as his starter of choice instead of a Jewel Knight starter such as Desire Jewel Knight, Heloise because he wanted to guarantee a copy of Knight of Twin Sword when he was able to begin striding. Lastly, he said he chose the 6 stand/6 critical line-up because stand triggers are far more valuable once you push your opponent to five damage, which the deck is easily capable of doing, and it allows for strong combos with Knight of Twin Sword if he gets lucky. Matthew wanted to thank ARG for hosting a well organized event, having accurate judges, and for choosing a great location for the tournament. He also wanted to give a shoutout to his local card store in Reynoldsburg, Ohio, known as Card Academy. He wanted to thank them for hosting the ARG Ohio State Qualifier and for providing the cards he needed in a convenient manner, as well as motivating him to drive all the way to Philadelphia to participate in the National Tournament! Once again, congratulations Matthew Day! That concludes this weeks article. Be on the lookout as the next season for the ARG Circuit Series will be starting up soon! Do you have what it takes to be the next champion?